In the UK spring has sprung and summer is lurking somewhere around the corner. 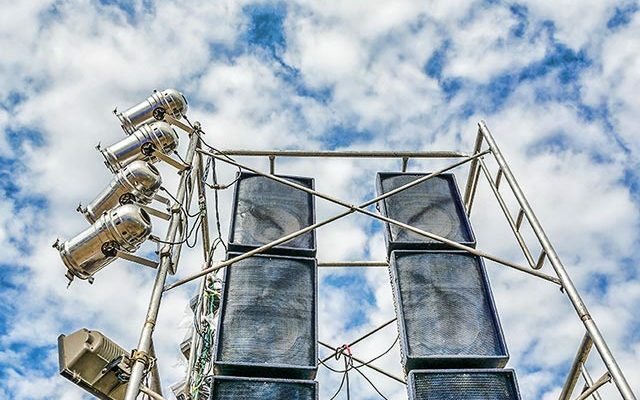 Across the country fetes, festivals and exhibitions are being planned and springtime powered access platforms have made staging outdoor events much easier. Local fetes, musical festivals in local parks, street carnivals and road races often need springtime powered access platforms that are flexible, mobile and able to operate safely on a wide range of surfaces and ground conditions. The same safety rules apply to access platform users regardless of whether it’s a private or public event. By law, all operatives should be fully trained to use powered access platforms and familiarised with the specific machine they are using. A full and detailed risk assessment needs to be carried out to identify any hazards in the work area and surrounding site. The fun event is for everyone and should not be marred by risk taking and serious accidents. Often at outdoor events, the work needs to be carried out while the event is going on and there are thousands of people around. When used properly, access equipment is one of the safest ways to work up in the air, at speed. However, be sure to create a safe working area so neither operatives or members of the public are at risk. Check the weather forecast – it can snow in Spring! Wind. Rain and mud are all potential problems. Be prepared and select the right equipment for the job – including personal fall protection. Outdoor festivals in the UK are hugely popular, often attracting thousands of people. Springtime powered access platforms play a key role in making them a success. For flexibility, stability and safety they are the best choice for working at height for anyone planning an outstanding summer event. Get out the brolly and the sun cream and let’s all have some fun. It’s not just the safety of MEWPs going up and down that’s important – it’s the delivery to site and transport back as well. The “To-ing and Fro-ing”. There are nearly a million deliveries a year of MEWPs, and whether your company is buying or selling one, or renting one out, there are risks to be assessed. 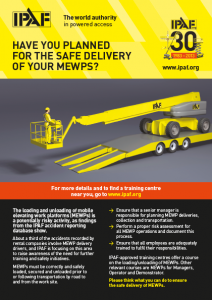 Of the incidents involving MEWPs over a third involved the delivery drivers, with engineers and operators accounting for over half. These are incidents happening even before the MEWP was put into workplace operation. So how were these accidents happening? For delivery drivers, half of the incidents reported occurred during the loading and unloading of the MEWP. Specifically, they were caused by insecure loads (often the canopy becoming loose during the journey) and machines that fell off between the ramps. For the engineers, incidents were identified when hand tools were being used and slipping or tripping when the MEWP was being prepared for operation. Platform operator incidents were as a result of lack of observation on unfamiliar sites and not giving enough thought to planning a route to where the MEWP was to be used. With the pressure on site to meet deadlines and schedules, it can be easy to overlook some safety checks. A risk assessment needs to be prepared before the MEWP arrives to ensure the safety of on site personnel and the public if offloading from the road. IPAF UK publish a very helpful leaflet for planning safe deliveries of MEWPs. 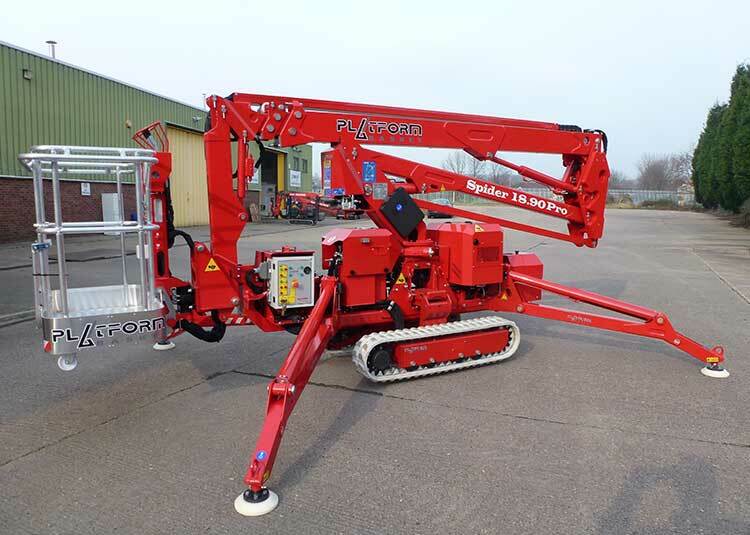 Powered Access Platforms are incredible machines providing companies with cost-effective ways of working at height. But, there are inherent risks associated with their use. The to-ing and fro-ing and not just the up and down operation must be given very careful consideration. If you need more help and advice with MEWP training find out more here and give Promax Access a call. There’s no doubt that the use of Powered Access Platforms can make the workplace safer and more productive. However, there are also dangers and pitfalls that need to be considered – especially the legal duties placed upon owners and users. 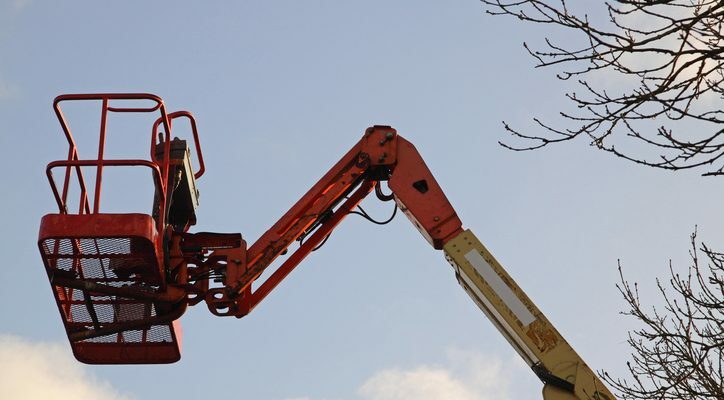 The risks of working at height accidents are reduced when using powered access platforms (Or MEWPs – Mobile Elevating Work Platforms as they are commonly known). When used for tree work they are faster to use than conventional ladders and ropes. 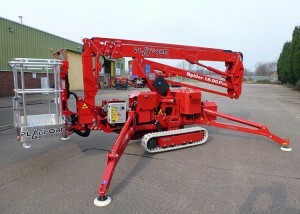 They enable quick access to those awkward to reach branches and are less tiring for the operators. More work gets done throughout the week and the operators are less tired and thus the risk of accidents through fatigue is reduced. Power Access Platforms are a great alternative to scaffolding. They provide easy access to those small but essential jobs high on roofs or ceilings that previously could only be accessed by erecting scaffolding. If the work involved is a routine inspection or small maintenance, the cost and inconvenience of erecting scaffolding can be prohibitive. They are also ideal for those small, “one off” jobs. Boom lifts with strong stabiliser legs and spreader plates reduce the pressure point between outriggers and the ground and can operate without damaging floors or delicate ground. Most can be operated with an electric motor as standard to minimise indoor noise disruption. Like all mechanised equipment, there are inherent dangers in using powered access platforms. Most accidents arise from their operation and use rather than from their movement on site. Research has shown that lack of adequate training is the cause of over 70% of accidents involving powered access platforms. Employers are obliged to provide access platform training for employees. If you are not sure what’s required, Promax Access provide a comprehensive range of courses to meet these legal training requirements. The Lifting Operations and Lifting Equipment Regulations 1998 (LOLER) was introduced to ensure that all lifting equipment was “fit for purpose” and subject to statutory periodic “thorough examination” with detailed records kept. It places these duties squarely with the people and companies who own, operate or have control over lifting equipment. All equipment must have a valid LOLER certificate and test carried out every 6 months for powered access platforms. To help you manage this essential certification, Promax Access have a LOLER reminder service. If your budget is tight or it’s your first foray into the world of powered access platforms, then consideration may be giving to purchasing pre-owned access equipment. It can, however, be a risky business. Ideally you need to know how old it is, what was it previously used for, has it got a full service and inspection history, was it maintained regularly, does it have an Operator’s Manual and, crucially a valid LOLER certificate? What might be considered a “bargain” may end up costing more than was bargained for. Promax Access is pleased to offer cost-effective, pre-owned powered access platform solutions, carefully selected from their existing customers or trusted partners. All are supplied fully serviced and inspected with a new LOLER certificate. Pre-owned access equipment is arriving all the time. Choosing the right type of platform access equipment for the needs of your job is essential and how the platform access equipment is powered is a major consideration. Different makes and models offer a choice of power sources for convenience and to work safely in different environments. The pre-job risk assessment will indicate specific requirements and power supply considerations. This non-compliance was mainly as a result of the instructions not having enough quantitative values that was either missing (45%), not traceable (75%), nor credible (64%). When using, or purchasing any powered platform access, it is essential to check the noise levels comply with legal requirements. The HSE website has a wealth of information on this topic. Noise levels are a major concern as there are both UK and EU regulations that govern how much noise you can make in specific environments, including indoor working and densely populated areas. In confined spaces, such as narrow streets or indoors, noise echoes off walls, ceilings and floors and the roar of a diesel engine can sound even louder than usual. All access platforms are marked with their sound power level so it is easy to tell when a particular machine is unsuitable for a particular working environment. Electrical power supplies are quieter than a diesel engine and are powered by either a mains supply or battery. 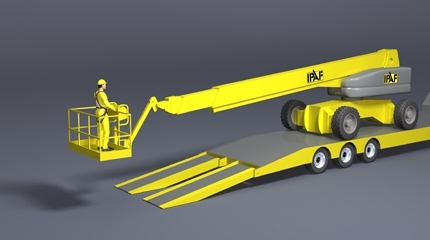 Most models of spider lift, tracked access platform or other equipment which is designed to work indoors have an electric or duel fuel engine. Wherever you are working, you need to make sure there is a sufficient fuel supply to complete the necessary tasks. A rapid battery charging system provides fume free operation for confined working spaces without the need to rely on AC power and trailing cables and is available on some newer models of machine such as the Spider 18.90 PRO-E which has a 300Ah lithium battery for an extended working lifespan. Engines are louder and are most common form of power supply on powered access platforms but need diesel or petrol to operate. They are suitable for use in a vast range of working environments and temperatures, on and off site and throughout the seasons. Whatever the job or working environment, select the type of powered access platform with the right power supply to meet the needs of the job and make sure it has sufficient fuel or access to energy to work safely and efficiently.